PVP Mall in Vijayawada have jumped in at the opportunity to create Sankranti feel in the mall. 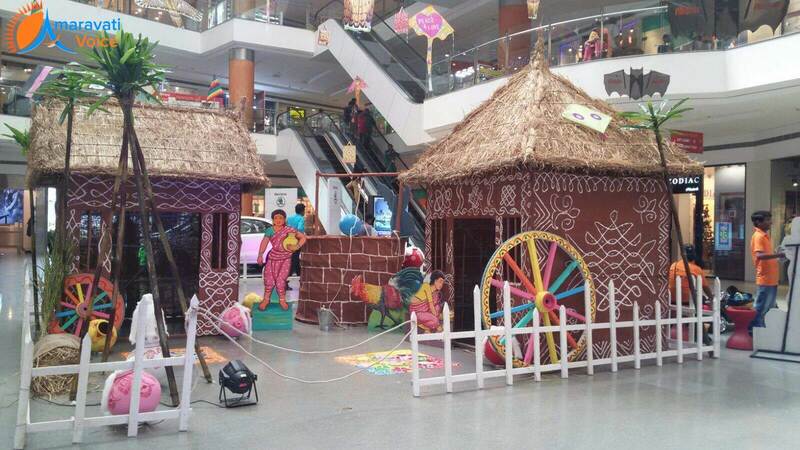 The mall is decorated with village feel, with huts, rangolis, gobbemalu and other things which we do at sankranti. True spirit of Sankranti was brought to life at PVP Mall. PVP Mall, is decoratedwith flying Kites, clay pots, golden grass, which is attracting the coustmers and visitors. The shopping establishments in the mall, are giving out special discounts and some are also oragnising contests and giving away attracting prizes. The visitors also taking photos and selfies infront of the setting. Also a kite making workshop was held for children on Thursday for the age group of under 11 years. The material was given for free and students enjoyed in the competition. Other clubs, resorts, hotels and sweet shops in Vijayawada city are also decked up for the festival and doing their creative promotions.